The following paragraphs were written by Walt Disney for "Wisdom" magazine in 1959. 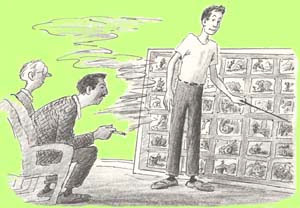 "The early cartoon-makers were hampered in an orderly preparation of stories because of the nature of their medium. 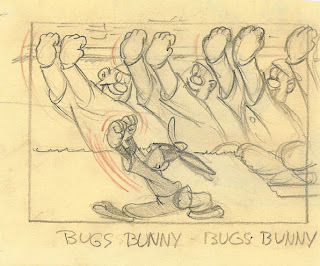 The written script used for live-action filming couldn't convey the swift action and fantastic effects that could be achieved in cartoons. A need for a better mode of presenting cartoon stories was felt. 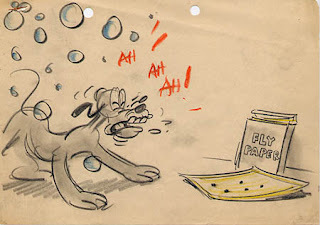 When the Walt Disney Studio was bursting forth with creativity in the early thirties, the first storyboard was born. Today it is standard procedure in the cartoon industry. 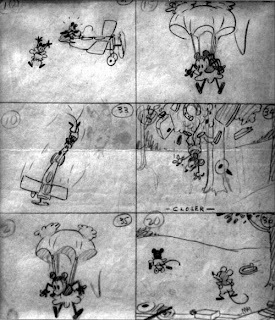 The storyboard is ideally suited to cartoon making. It tells the story graphically, exactly as the camera's eye will see it, and is also flexible. Changes in the storyboard can be made by merely unpinning sketches and substituting others or even changing the sequence of the boards. The boards show pace, movement, excitement. Sixty boards generally comprise a board. No attempt is made at art. The sketches are made boldly, so they can be read across a room. Usually they are done with black pencil or charcoal since color can give a board a jumbled appearance. However, color is occasionally used to suggest a mood or illustrate a costume. With its many sketches underlined with strips of paper containing the dialogue or musical lyrics, the boards take on the appearance of a comic strip. A feature requires 25 or more. 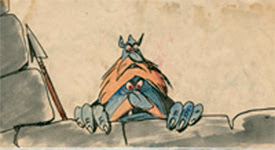 Here's an interesting interview with one of Disney's top story-men - Bill Peet. According to him, Walt would periodically hire big time screenwriters, but they never worked out and it was a waste of money. Warner Bros. cartoons are the best written and funniest cartoons in history. They also have the most developed personalities. 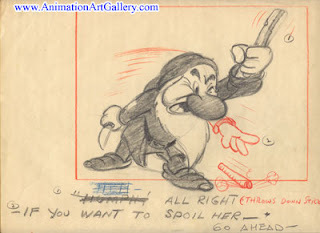 The storyboard artists drew very rough and not on model, because these writers were more concerned with telling the story than doing finished art as they drew the storyboards. It was up to the animators and assistants to do the finished slick art. How many of you storyboard artists out there go insane when you read scripts written by non-artists that just don't work? Post some horror stories in the comments.